Find out about the most common symptoms and complications of myeloma. Download our helpful Infosheets and watch our videos to hear other patients’ stories. Myeloma can affect your body in several ways. Most of the symptoms and complications of myeloma are caused by the build-up of the abnormal plasma cells in the bone marrow and the presence of the paraprotein and/or light chains in the body. You can read more about plasma cells in the What is myeloma? section. Pain: the main cause of pain for myeloma patients is myeloma bone disease. Effective control and management of pain is an important aspect of myeloma treatment. 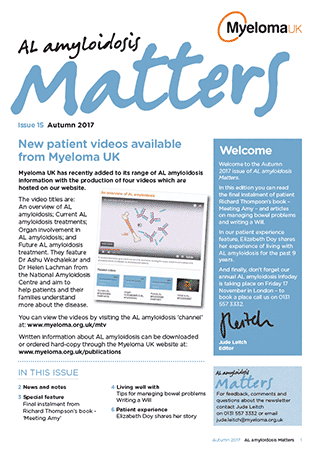 Our Pain and myeloma Infoguide has more information. Bone disease: your middle or lower back, rib cage and hips are the areas most likely to be affected. Myeloma bone disease can cause bones to fracture. You can download more information on myeloma bone disease and bisphosphonates from the foot of the page. Fatigue: persistent fatigue, or an overwhelming tiredness, is common in myeloma. It may be due to the myeloma itself, or to a complication such as anaemia – a condition in which the amount of haemoglobin in the blood or the number of red blood cells is below the normal level, causing shortness of breath, weakness and tiredness. Fatigue may also occur as a side effect of treatment. Download our Fatigue Infoguide. Recurring infection: infections are common in myeloma patients because the myeloma and its treatments interfere with the immune system. 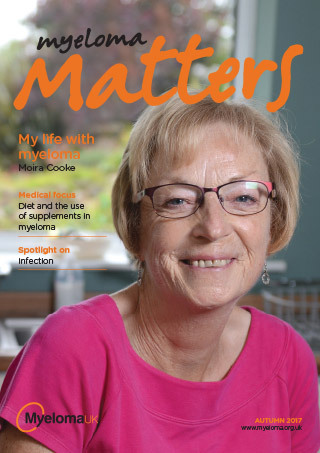 Download our Infection and myeloma Infoguide. Kidney damage: the abnormal protein (paraprotein or light chains) produced in myeloma can damage the kidneys, as can some of its other complications, such as hypercalcaemia (a condition in which the level of calcium in the blood is too high). Some of the drugs used to treat myeloma can also sometimes cause kidney damage. Download our Myeloma and the kidney Infoguide for more information. Peripheral neuropathy: damage to the nerves that make up the peripheral nervous system – that’s the nerves outside the brain and spinal cord. This can be caused by the treatments for myeloma and also the myeloma itself. Download the Peripheral neuropathy Infosheet. Not everyone will have all or any of these symptoms and complications. Supportive treatments are commonly used alongside and after anti-myeloma treatment to relieve and, in some cases, help prevent these symptoms and complications. It can be helpful to keep track of how you’re feeling on a daily basis. Order our specially created Patient diary to monitor your symptoms. We’ve created several further resources to guide you through the symptoms and complications of myeloma. Each Infosheet contains information on what causes it in myeloma, its signs and symptoms, how it’s treated, and tips for self-management and prevention.